New in Campaign Tracker version 2.0 is the ability to see exactly what pages a lead visited on your web site, and the dates/times they viewed those pages. You can even see multiple visits / sessions from the same lead, to understand their buying process and what pages on your site they were the most interested in. 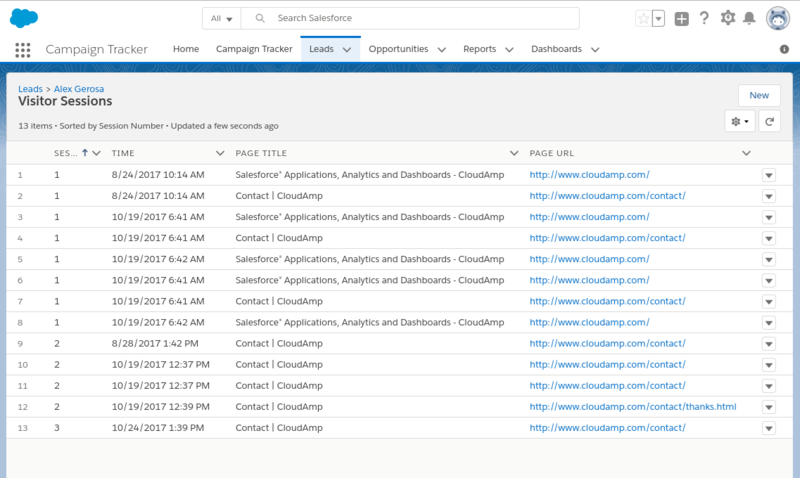 Visitor Sessions are stored in a custom Salesforce object related to the Lead / Contact, so the information is easily accessible to sales and marketing, and stays with that lead as they get converted in Salesforce. Understand the lead's navigation through your web site - which pages they viewed, how many times they returned - in addition to the lead source tracking. Session Number - Was this the first visit or a return session from the same visitor? Date and Time - The date and time the lead first viewed this part of your web site. Page Title - The title of the page on your web site. Page URL - The web address of the page on your web site, just click to open in a new tab. 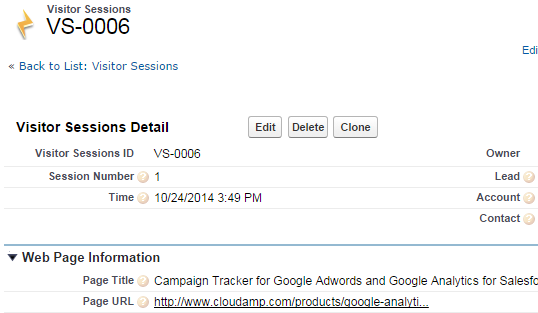 Lead, Account, Contact - Which record is this visit related to?